Palmer came through! Sort of. 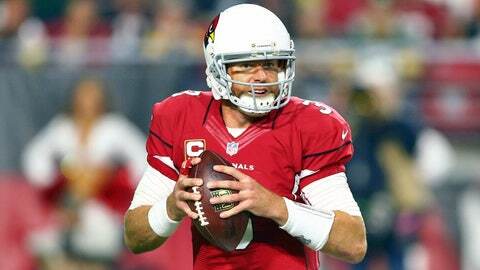 Arizona Cardinals quarterback Carson Palmer was having a strange night. The veteran, who had been accurate all season, had already thrown two interceptions in Saturday’s NFC divisional-round game against the Green Bay Packers — both with his team deep in enemy territory. And with the Cardinals driving for a go-ahead score in the fourth quarter, Palmer came within centimeters of a third pick. … Michael Floyd caught the deflection near the back of the end zone. Touchdown, Cardinals.